Opening 6.5 acres for agriculture with needed infrastructure, including: field irrigation system, tractor, washing and packing station, and walk-in cooler. 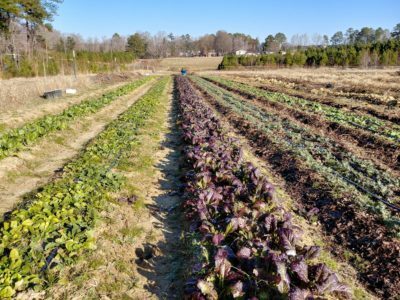 Working with eight farmers from five different farming businesses who harvested a combined total of 4,950 pounds of produce. Hosting 15 volunteer events and two interns at the farm, with a total of 687 hours of community service. Securing funding and planning for 2018 programming supporting our goals of equity in farmland and food access, including a subsidized CSA, SNAP EBT and double bucks, and scholarships and training for women farmers and farmers of color. Creating an innovative partnership and national model that has garnered media attention and fulfilled a wide range of goals, including conservation, historic preservation, food access, economic development, and community education. We look forward to expanding upon this success in 2018!